AMBS Ecology & Heritage is seeking individuals with experience in fauna survey who are enthusiastic about fieldwork. We are an established business with a growing portfolio of clients and projects in the ecological sector. Our work includes flora and fauna surveys, biodiversity monitoring, ecological impact assessments, Biodiversity Assessment Methodology (BAM) reports, preparation of flora and fauna management plans, and implementation of fauna management measures such nest boxes and fauna “spotters”. Most of our projects incorporate a fieldwork component and some of the work is seasonal. Specific tasks typically include surveys for native birds, reptiles, frogs, mammals (including bats) and sometimes threatened invertebrates and fishes. Survey techniques may include call recognition, spotlighting, trapping (pitfall traps, Elliott traps, harp traps, etc. ), use of bat detectors, song meters and remote cameras, hand searches for reptiles and frogs, identification of scats and tracks, and identification of habitat features (including but not limited to active tree hollows). 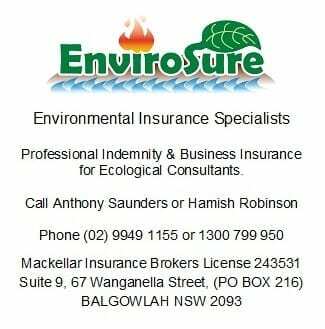 Criteria that are not essential, but will be well-regarded, include experience in the ecological consulting industry, a current Senior First Aid certificate, ability to drive a manual vehicle, experience using a 4WD in off-road environments, and/or a “White Card”. • The cover letter should state whether you are interested in a casual or full-time role, or either, and which fauna groups and techniques you have experience with. • Enquiries about the position can be made to the same address or by calling 02 9518 4489. All applications and enquiries will be treated with the strictest of confidence.